What do you see when you watch corporate news? No. What do you really see? More often than not, we tune into the latest news about supposed societal and world events, and we believe that what we are watching is accurate to a large degree. However, what if it weren't? The corporate news promotes itself as being highly accurate and true to the facts. Yet, as we have often discussed, the MSM is not at all what it's cracked up to be. Many of us have realized that most MSM sources represent little more than the public voice of political manipulators who are working to sell their own bias narrative about our societal and world situation. However, as we already know, there is much more to our world than these sources reveal. Yet even when we look beyond the typical manipulative MSM news narrative, we see another layer to that which is presented. Though the information we see may appear to be based largely upon fact, evidence is increasingly revealing the possibility that many of the supposedly serious political exchanges we've witnessed in recent news may have been little more than theatrics. True, the people may be real; the situations they discuss may be real—at least in part. However, the dramatic element to these exchanges, the seemingly retaliative responses which often follow the initial instigation, and the sensationalist way in which the MSM reports these exchanges between political figures often come across as mere distraction and empty political fluff. Along with these theatrics, many public officials may actually engage in various types of psychological warfare against one another. At times, what may appear to be opposition between two or more parties might actually be cooperation and alliance behind closed doors. What may appear to be cooperation may actually be strategic position for future plans of opposition. These optics can also offer a sort of illusory experience for the general public. However, in certain instances, instead of simply being empty showmanship, these optics could actually have significant intention behind them. This brings us to our question of interest. What might we find upon looking behind the recent meeting between Trump, Pelosi, and Schumer? This article tackles a number of topics which have been discussed in recent political news. However, the drama of such mainstream reports does not represent the intent behind this particular post. Without getting into the politics behind the situation, I will merely state that I am an advocate for cooperation between nations in a way which respects the freedoms and boundaries of all parties involved. However, the present situation at the southern border has not constituted this respect. Whether a boundary is personal or national, everyone has a right to decide who crosses and who doesn't, and this right goes both ways. According to my own experience, those who claim it is wrong to maintain such boundaries—whether personal or national—typically do so because they intend to violate those boundaries in some way. Cooperation is ideal; however, just as in every case in life, safety and respect are necessary components to any level of cooperation. When the rampant human trafficking, drug trafficking, and sexual slavery are brought to an end, I look forward to both countries being able to travel and cooperate in full respect of one another's boundaries. Even further, I look forward to a world in which people are responsible for their own actions, where people respect all others as equal, and where such exterior restrictions as borders are no longer necessary. With that said, let's get this discussion started. Most of us will know about the recent meeting which took place between President Trump, Dem. House Speaker Nancy Pelosi, and Senate Minority Leader Chuck Schumer. This meeting was intended to facilitate some type of communication as to how the issue of border security might be solved, or at least, this was the itinerary that was announced to the American public. However, upon closer investigation, the meeting seemed to progress differently than the average political exchange. As per usual, mainstream reports about the meeting placed their typical dramatic spin upon the event. You can read the somewhat dramatized details here. It seems clear that after the meeting, President Trump was not very pleased with the way the discussion went. However, according to his statements following the meeting, he was not expecting cooperation from either Pelosi or Schumer. It was as though the president never expected these two figures to cooperate. Otherwise, there would have been no reason to leave the room without further effort. So then why did the meeting take place to begin with? According to Pelosi and Schumer, President Trump's behavior was unstable and angry. They claim that he stormed out of the room after not getting his way. Of course, we do not know for certain what may have taken place during that time; however, we do know that multiple other officials who were present claimed that it was Pelosi and Schumer who behaved irrationally. Though none of us were actually witnesses to anything that went on in the meeting between Trump, Pelosi, Schumer and others, there are a few logical observations we can make. It would make sense that these particular characters as well as the MSM would attempt to badmouth Trump following the meeting. We can clearly see the inconsistency of a number of political figures along with the corporate media in their reporting of Donald Trump. In fact, before he ran for president, the entire corporate media loved him, as did many of the political figures who claim to despise him now. To reemphasize, most of the public figures who seem to oppose Trump now loved him before his bid for presidency. This is one of the many pieces of evidence we have which suggests that the opposing stance which many public figures assume against the president is merely an act; just part of the show. This is not to say that behind the scenes, everyone is friendly with one another necessarily, but rather to say that those who appear to oppose the president may only be working toward either their own advantage or to the advantage of interests who they work for. It also appears that figures such as Nancy Pelosi and Chuck Schumer are putting on their own show as well. As we may know, Schumer actually made a name for himself by promoting the same principles he is now claiming to oppose. In fact, numerous past officials on either side of the discussion fought for the same standards which the president is now delivering. Yet now that these standards are coming into being, many of these figures are flipping their stance completely. It seems that those who have proven to be disingenuous in recent years have little or nothing to offer to the American public except for more of the psychological manipulation we have become used to seeing from corporate media. Regardless of our political views on the situation, no one likes being lied to or being deceived for political advantage. When the people wake up and realize how thoroughly they have been used, deceived, and extorted as political leverage, it is very doubtful that there will be a single person taking the side of these disingenuous manipulators or the MSM sources they control. It is only when we first realize our ability to question and verify information in a reliable way that we begin to do so, and as we do, we often find that the information we are handed by established media is grossly deceptive and manipulative. Yet even this general deception does not fully cover the true significance of the entertainment and news the MSM peddles to us on a daily basis. In order to fully gain this knowledge, we need to dig deeper. In order to understand the possible significance of the recent presidential meeting, there are a few observations we need to make. The first is that the Deep State or Cabal has been at their game of global deception, extortion, and manipulation for nearly a century. According to testimony, these elitists believe these practices give them some supernatural ability to rule over humanity. One of the practices of these elite cultists is the heavy use of symbolism within their communication with each other or with the public. These cabalists actually use symbols, innuendos, analogies, and subtle references, and they do this so that their schemes remain largely undetected by the general public. As we may know, many current government officials are actually participants in the private dealings of the Deep State. Consequently, these parties tend to have a keen understanding of this symbolism and even use it in their various forms of official and unofficial communication. By this point, many of us may know that President Trump is not working alone. In fact, according to multiple sources, Trump is merely the frontman of the positive Alliance that is working to thoroughly defeat the Cabal. Behind the scenes, an international coalition of military forces is working together to neutralize all former Cabal strongholds and personnel. So when we see President Trump making any seemingly strategic move against the Cabal, it is most likely due to the fact that the Alliance has pre-planned this action as part of their ongoing efforts. If this is the case, the recent meeting on the topic of border security may have been much more than corporate media sources reported. According to multiple sources, the Alliance that is working to defeat the Cabal at every turn is fully aware of the Cabal's tendency to communicate through symbolism. In fact, these Alliance operatives—along with their efforts to utterly defeat the Cabal—have often used these subtle innuendos to taunt Deep State operatives and to hint at their future plans to crush the Cabal forces without revealing the specifics of their plans. We might also note that by all appearances, President Trump along with the Alliance has actually been using ancient Chinese battle strategy to mount their assault. While the media has done everything to paint the president in a negative light, these Alliance operatives appear to have been cleverly defeating the Deep State through psychological means. This brings us to a very interesting question. What if the meeting were not intended to accomplish actual negotiations, but to instead, offer an ultimatum to Schumer and Pelosi before proceeding to other methods of resolution to the situation? So now, not only does the Alliance know the symbolism of the Cabal, but many average citizens are awakening to these symbols to the point where people are becoming more able to recognize nefarious plans before they can be carried out. If we look closely, we can actually see these subtle communications taking place between Trump and his two Democratic counterparts sitting across from him at the meeting table. We have heard from certain sources that this meeting between Trump and these Democratic representatives would include an ultimatum. Some may refer to this ultimatum as a Godfather deal. This type of "deal" has reportedly been given to many government officials in the past; however, in those cases, the intentions were largely criminal in nature. As the method goes, one or more people are sat down and given an offer they can't refuse, so to speak. In other words, the individuals of interest are threatened with dire consequences unless they acquiesce to the "suggestion" given by the person holding all the cards. We might imagine that if such a deal were given to Pelosi and Schumer, the meeting may have consisted of events besides a president handing out candy bars—unless of course the candy bars were the message. But how could this be? According to a tweet from Washington Post reporter, Seung Min Kim, the candies distributed were Baby Ruth, Butterfinger, and M&M candies. Needless to say, this gesture was completely unorthodox and somewhat strange for an American president to do at such a reputably tense meeting. This makes it very likely that there may have been some goal behind the gesture. 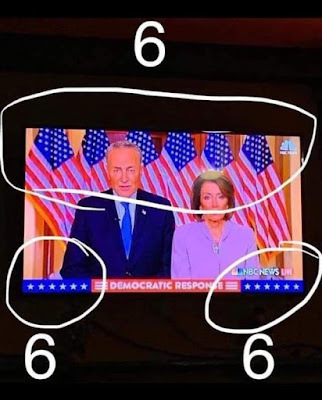 And seeing that Trump, Pelosi, and Schumer were well-familiar with symbolism and tactics of psychological warfare, the message may have been at least partially received. By all appearances, Nancy Pelosi and Chuck Schumer are working for Deep State interests in their efforts to maintain their lucrative business of drug and human trafficking across the southern border. If these two are Deep State/Cabal operatives, then they know very well how to recognize symbolism as well as anyone. They also know strategies of warfare—both psychological and combat-based. So when they walk into a meeting and they see their president behaving with high confidence while strangely offering them candy, they would likely know that something is off. In fact, they might become quite nervous at the mere sight. To add, if Pelosi and Schumer were familiar with the history of the candies Trump reportedly offered during the meeting, they might have even been shaken by the sight of them. But why? If we were to look into the history of these candies, what might we find? It's fairly rare that any us take the time to read the history of the average American candy bar. Most of us are too busy with other matters to look into such trivial history. However, in this situation, such meticulousness might give us valuable perspective into the possible mystery behind the recent presidential meeting. The following is a brief history of the famed candy bar we know as Baby Ruth from History.com. The story begins as Curtiss Candy Company owner, Otto Schnering was having difficulty with sales in the early 1920s. According to history, Schnering had just invented the candy bar and was suspected to have used the name of a famous baseball star as its namesake. At first glance, it seemed clear that Schnering had taken advantage of the home run king’s well-known name and tweaked it by one letter in order to avoid paying the “Sultan of Swat” any royalties. Perhaps because of its perceived connection to the Yankee slugger, Baby Ruth was a grand-slam success. By 1926, sales of the candy bar totaled $1 million a month, and the company’s candy-making facilities were the largest of their kind in the world. Schnering even dispatched biplanes from coast to coast to shower cities with millions of Baby Ruths tied to little silk parachutes. The free candy raining from the heavens was the stuff of children’s dreams. In 1926, Ruth decided to enter the candy business himself and licensed his name to the George H. Ruth Candy Company, which sought to register “Ruth’s Home Run Candy” with the U.S. Patent and Trademark Office. Wrappers showed a head shot of a smiling Ruth in his uniform along with the note “Babe Ruth’s Own Candy.” The Curtiss Candy Company sued for copyright infringement and claimed that the candy bar had not been named after the baseball star, but Ruth Cleveland, eldest daughter of President Grover Cleveland. The explanation seemed odd given that the girl nicknamed “Baby Ruth” by the press had been born in 1891, three decades before the introduction of the candy bar. By 1921, not only was she not a baby, she wasn’t even alive, having died of diphtheria in 1904. Newspapers and the American public paid close attention to “Baby Ruth” after her father returned to the White House in 1893 for his second presidential term, but the Cleveland's fiercely protected their daughter’s privacy and refused repeated requests by American newspapers to take her photograph. Few Americans ever knew what “Baby Ruth” looked like. By 1921, Babe Ruth was a household name while “Baby Ruth,” who died 17 years beforehand, was an historical footnote. As stated previously, the history of these candies may not initially present much meaning in a political or negotiatory situation. However, when we consider the implications behind the odd gesture of offering these candies at an obviously adversarial meeting with unwavering Democratic opponents, the situation changes. There are a variety of subtleties which we may note when considering the entire history of the Baby Ruth candy bar. It is likely that Pelosi and Schumer were attempting to mull through these possibilities themselves during the recent meeting. It is also likely that these two knew that when the meaning came forward, the truth they found would not be pleasant to realize for either of them. The story of Babe Ruth (referenced by the candy bar) is best known for the Babe's famed home run call in 1932. His confidence prior to hitting this iconic home run may be one of the most memorable moments in baseball history. We might also consider the fact that President Grover Cleveland was in the White House at that time when Babe Ruth was gaining popularity, and that this president ended up serving two terms. According to history, it was actually President Cleveland's name (or that of his late daughter) that was said to be directly associated with the candy bar. However, this fact is somewhat disputed. We might also consider the detail that these candy bars were at one point dropped out of airplanes as free gifts to would-be customers during the 1920s. If Pelosi and Schumer were aware of these details, chances are they were extremely apprehensive upon receiving an offer of the candy bar. The story of M & M candies is probably one of the more well-know tales of iconic American candy. We may remember how their inventor, Forest Mars, traveled overseas and borrowed the idea from the Spanish candies which soldiers were eating in the field. However, instead of going over the entire story, let's hear it from the helpful website, ThoughtCo.com. Forest Mars, Sr. was already part of a family-owned candy company in conjunction with his father, having introduced the Milky Way candy bar in 1923. However, father and son disagreed on plans to expand to Europe, and in the early 1930s, estranged from his father, Forest moved to Europe, where he saw British soldiers fighting in the Spanish Civil War eating Smarties candies—chocolate candies with a hard shell, which were popular with soldiers because they were less messy that pure chocolate candies. Upon returning to the United States, Forest Mars began his own company, Food Products Manufacturing, where he developed, among other things, Uncle Ben's Rice and Pedigree Pet Foods. In 1940 he began a partnership with Bruce Murrie (the other "M") and in 1941 the two men patented M & M candies. The treats were initially sold in cardboard tubes, but by 1948 the packaging changed to the plastic pouch we know today. The enterprise was a rousing success, and in 1954, peanut M & Ms were developed—an ironic innovation, since Forest Mars was deathly allergic to peanuts. In this same year, the company trademarked the familiar "Melts in Your Mouth, Not in Your Hand" slogan. It seems that M & Ms were created by the same company which invented the Baby Ruth bar. However, unlike the Baby Ruth, M & Ms were created after Forest Mars parted ways with his father and struck out on his own to invent his own version of the candy business. The fact that Trump served these candies may be in reference to the fact that he intended to part ways with the two Democratic representatives sitting across from him if necessary. Another possible message behind serving these candies may have also been that Trump intended to find a suitable partner to work with after leaving these two Democrats behind. When we combine these two messages with the possible messages from the offering of the Butterfinger candy bar, the story seems to take on a new flavor. Of course, most of us are well familiar with the iconic Butterfinger candy bar. Interestingly, this bar was invented by the Curtiss Candy Company as well—placing a direct historical connection between these three candies. This may become particularly significant as our discussion continues. Here is EHow.com with a brief history of the Butterfinger bar. The Butterfinger candy bar was created by the Curtiss Candy Company in 1923. A contest was held to create the name. The Curtiss Company dropped free butterfingers from airplanes in several cities to publicize the candy. Later, it was then sold to the Nabisco Company. Legend has it that the original recipe was lost, causing Nabisco to create a copy of the original the best that they could. It remained a favorite seller and continued to be so after Nestle bought Butterfinger in 1990. Let's consider the situation for a moment. We have these three popular American candies which have a shared history of ownership. They are connected with big names in sports and past American presidents, and their history is dotted with significant drama which has led them to their present standing as American icons. Now we have this history of the Butterfinger candy bar added to into the mix. If we consider the uniqueness of the story of the Butterfinger, we may note the fact that the candy bar is not its original version, but it is instead a copy of the original. The actual recipe was allegedly lost and its best replica has been sold in its place to this day. (We may also count the fact that this candy bar—like the Baby Ruth—was tossed out of airplanes as well.) If this is the case and Pelosi and Schumer were aware of these facts, they might have been all the more worried about their own safety during and after the meeting. They may have considered the fact that M & Ms were the product of two business partners—father and son—after they parting ways. They may have also noted the fact that two of the three candies had been tossed out of airplanes, and that one of these three candies is believed to be a mere replica of the original version. When these attributes are combined with the confidence of Babe Ruth calling his home run and a noteworthy president serving his second term, the significance behind this collection of historical occurrences seems immense. There is a very strong chance that both Pelosi and Schumer knew the intended message behind Trump's gesture. What likely made the unspoken statement even more unnerving was the fact that there was no certainty behind it. "Should we be afraid for our lives?" they would likely be asking. "What's this candy supposed to mean? What's up your sleeve, Trump?!" we can imagine both of them thinking in angst. It is very likely that these two already know the peril they are both in when it comes to possible criminal charges. They know that the American military and the best of U.S. intelligence had the inside knowledge of their past (alleged) corruption. They may also know that President Trump and the Alliance are keeping them around because they find them useful. Even if this were not the case, these thoughts were likely racing through their heads during and after their meeting with the president. "We can either do this the easy way or the hard way. Either we make a deal here—including the wall and whatever it is that you think you need—or we can go our separate ways and my people will get this done without you. Making copies of political figures and disposing of the originals is not a difficult task nowadays. If you should happen to fall out of an airplane some day soon, that would be unfortunate, but we would do our best to move on without you." Considering the alleged history of Pelosi and Schumer combined with the clicks these two have allegedly run with, this may not be the first time these representatives have received such a subtle and yet severe threat. If this was the intended message behind President Trump's sweet treats, it might seem somewhat extreme. However, in any case, if you are going to send a clear and direct message to people of the repute of Schumer and Pelosi, it is typically best to speak the language they are most familiar with. The art of war—commonly known as Sun Tzu—has been a major subject of study by some of the greatest businessmen and strategists in history. This ancient collection of Chinese wisdom has helped countless people accomplish their goals of influencing people in the masses. Though the overall strategies of the this text could be considered largely manipulative, these tactics can prove to be very helpful in avoiding large conflict by defeating the opposition without violence. As we've said before, the Alliance along with President Trump appears to be well familiarized with these tactics and uses them often in accomplishing their temporary and long-term goals. Take the recent meeting on border security for instance. Below are a few of the tactics which the president appears to have used during the meeting with Pelosi and Schumer. As we can see, these tactics have multiple purposes. However, in this case, it seems the goal of their use was likely to communicate an ultimatum without uttering a word. Strategy 1 "瞒天过海" - Deceive the sky to cross the ocean. Moving about in the darkness and shadows, occupying isolated places, or hiding behind screens will only attract suspicious attention. To lower an enemy's guard you must act in the open hiding your true intentions under the guise of common everyday activities. This originally comes from the book, Sun Tzu Chapter 3: Attack by Stratagem. Under normal circumstances, if a person offers candy at the meeting, there would not appear to be any underhanded intent behind the gesture. However, because Pelosi and Schumer are familiar with subtle suggestion, chances are they would be internally frantic in attempting to search for any meaning. The act is most unusual, in any case, and would have likely thrown the Democratic duo off significantly. When we look at the mere act of offering candy at this meeting, and considering what we know about both Cabal and Alliance methods of communication, it seems clear that the offering of candy actually combines three of these tactics into one psychological assault on the intended targets. The act might initially come across as juvenile and immature (Strategy 27). It also works to somewhat charm the target (Strategy 10) and possibly cause them to drop their guard (Strategy 1), at least momentarily. The entire combination of tactics seems to culminate into Strategy 20 and could have easily thrown both Democrats off of their originally confident stance. The situation may have been extremely frustrating and nerve-racking for both Pelosi and Schumer, and this may have caused them to lash out at Trump. If this is the case, it would have explained why multiple parties emphasized the notion that both Democrats actually behaved rashly and not the president. If what we have discussed here is true, it means that Trump and the Alliance are actually holding all the cards and have no reason to behave the way the corporate media claimed that Trump did. Yet even if he did "storm out" as stated by media, it may have been part of the act in order to emphasize the parting of ways referenced by the history of M & Ms candies. When we look further into the stratagems of Sun Tzu, we will likely see even more knowledge of psychological warfare being applied against the Deep State. When considering the seemingly rampant use of Twitter, we might realize the possibility that the president is actually baiting the press (Strategy 17) to expect their resources in order to help him look like a fool (Strategy 27) so that he can continue his plans in secret. By making the statements he has become ridiculed for, he is giving the press little nuggets to grab with each tweet (Strategy 7). The press makes fun of him for misspelling a word or two, but according to analysis, each typo is actually used as communication. In all this, Trump appears to be keeping all of his plans hidden while using the resources of MSM (Strategy 3) to help conceal his true intentions. There may be many more of these tactics being employed by President Trump and the Alliance (Strategy 35), and as you can see, the method can get a bit confusing. There can be layers upon layers of these tactics used one on top of another, and this can add to the confusion of the enemy (Strategy 8) and help a warrior achieve victory. 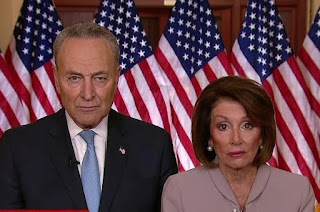 Do you remember the very strange and unsettled look on Chuck and Nancy's face after the president's address to the nation? They looked terrified and extremely stiff in their poise—much more so than any other time we've seen them in public. In fact, Republican Rep. Ted Cruz even commented saying that the Democratic address following the meeting looked like a hostage video. Though Ted did not seem to state the entire possibility behind their odd demeanor, his observation seems very accurate. 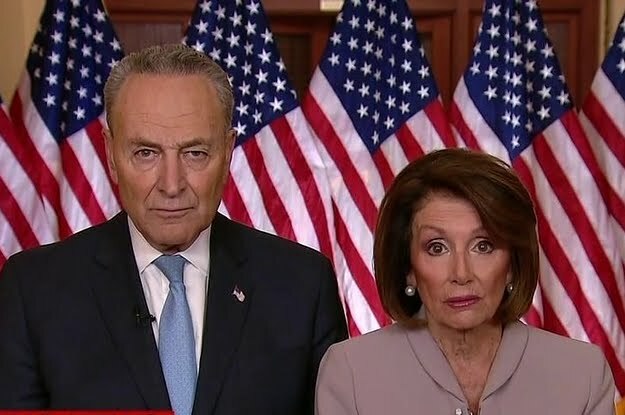 It seems very possible that Chuck and Nancy are not hostage of their own party—or at least that was not the cause for the look of sheer terror in their eyes following the meeting with President Trump. These two characters were most likely afraid because they knew the message Trump sent them through the innocent gesture of offering candy. As usual, we see the clear use of symbolism and code to communicate with the public and possibly their few remaining Deep State allies (in this case, we see the rather notorious numerological sign of the triple six). It seems clear that these two do not at all appear to be their usual relaxed and confident selves. Instead, they appeared to want to scream, but are trying to remain composed for the camera. It seems that at that moment, they were regretting their demands to address the nation following President Trump's meeting/offer. The question is, "Who is truly behind this broadcast—the Deep State, or the Alliance?" If these two characters look like deer in headlights, an ultimatum from their president may have been the cause. This would also explain why Pelosi may have been blinking S.O.S. in Morse code as Chuck gave his speech. If the situation we have suggested here were accurate, what else could she do? 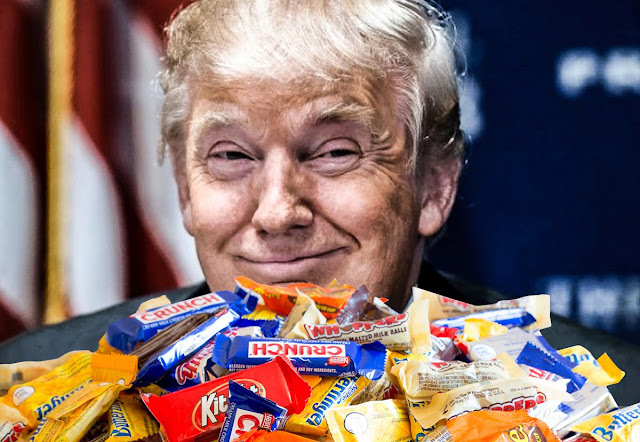 If it is true that Trump and the Alliance gave their ultimatum via candy, this is a very intelligent and strategic move, and will most likely be successful, in my opinion. If this was a reason and the coming operations to carry out this ultimatum are successful, we will likely see these Democratic representatives suddenly flipping their position on the border wall and claiming that it is wise course in moving forward. Of course, in this, we might consider the possibility that the Alliance has already followed through with these plans to neutralize the opposition in this way. It could be that Pelosi and Schumer are already either under Alliance control or that they have already been apprehended (and possibly even cloned). We might also remember the attribute of theater which may be ongoing in corporate media and apparent political discourse. It could be that these two Democrats are merely playing a part in exchange for a reduced sentence or partial pardon for crimes they may have committed in the past. More significantly, it may also be that many of the big names which most of us have been looking forward to seeing face justice have already been tried, convicted, and sentenced. Whatever the situation may be, it is important for us to realize that not everything we see is as it seems, and that when we believe we are seeing apparent political drama, difficulty, and national adversity, we may merely be witnessing the gradual revelation of the numerous issues which were actually resolved months ago.